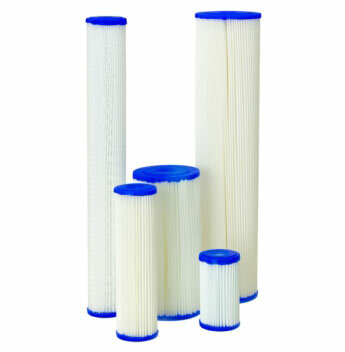 Resistant to chemical and bacterial attack, reusable Proflex™ cartridges deliver maximum dirt-holding capacity and are effective for a variety of heavy duty commercial and industrial filtration applications. [tab:Product Operation]Proflex™ Series EF-250VP & EF-450VP Cartridges are manufactured from a durable, non-woven and reusable polyester media pleated around a polypropylene core for added strength. The media is pleated to maximize dirt-holding capacity and minimize cartridge change-outs or cleaning. The ends are then immersed in a thermo-setting vinyl plastisol that fuses the cartridge components together, forming a unified endcap gasket. Filtration efficiency is enhanced by sonically welding the overlap seam to reduce internal bypass.